Captain Bruce Chard is a full-time Florida Keys Flats guide. For over 20 years now he has guided many anglers to their catch of a lifetime for bonefish, permit and tarpon. Being a Federation of Fly Fishers MASTER Certified Fly Casting Instructor, Capt Bruce has conducted, and taught many of his own personal fly fishing schools internationally in the Bahamas, Guatemala, and all over the U.S.
Bruce Chard is one of the top guides in the Florida Keys and big bonefish are one of his specialties. 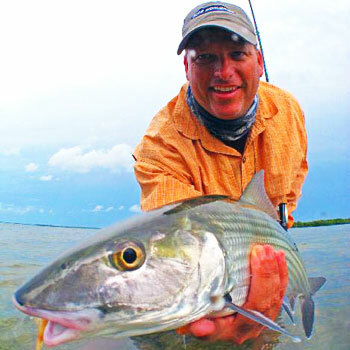 Listen in to find out his secrets on landing a bonefish of a lifetime. Bruce Chard is in the business of persuading permit to take his fly and he won't take 'No' for an answer. Listen to this show to find out Bruce's insider secrets of persuasion. Bruce Chard, a professional guide the Florida Keys, takes us for a ride through the palolo worm hatch. This once a year event will get anyone's adrenaline pounding. Join us to find out where, when and how to fish this incredible event. As a paid speaker at sportsman shows around the U.S., Bruce has had the opportunity to establish a working relationship with many of the largest companies in the fly fishing industry, leading to the development of the Capt Bruce Chard - Jim Teeny Professional Grand Slam Series of fly lines. The Chard Permit Fly Line, Chard Tarpon fly line, and Chard Redfish-Bonefish fly line, by Jim Teeny Co. (a leader in the development of the most specialized fly lines in the world). Bruce has also been featured in many major fly fishing catalogs with Ross Reels, G-Loomis Rods, Thomas and Thomas Rod Company, Riverborn Fly Company, Jim Teeny Fly Line Company, and Yellow Dog Fly Fishing Adventures. Ross Reels has used Bruce extensivly in their advertising in over 8 different fly fishing magazines and online websites. You can find Capt Bruce on the cover of 5 major fly fishing magazines, numerous fly fishing articles, and televised fly fishing shows. As a new innovative fly designer, some of Capt Chard's flies are being sold world wide trough Riverborn flies. Chard has over 27 Fly Patterns available through Riverborn Fly Company, ranging from Bonefish, Permit and Tarpon Flies. Many more flies are being added to the Chard collection through Riverborn every year. Look for more exciting things to come from Capt Bruce in the future. To learn more about Bruce's guide services, schools and proucts visit his website, www.BruceChard.com.